The Bodi tribe is just one of the many tribes that can be found in different African countries. These tribes have their own unique cultural practices that make them stand out from other tribes. Though some of the practices observed therein might seem extreme or and unnerving, tradition is tradition and we have to respect that except it causes undue harm to the people in general. With a focus on a tribe called “Bodi,” it is an Ethiopian tribe that can be found in the southern part of the country. The tribe has a small population of 9000, and they reside near the Omo river, occupying about 1900 sq.km.They are bordered by the Mursi tribe as well. Both tribes though similar in several cultural patterns, clash from time to time. As a tribe, they are a group of people who are largely dependant on their livestock. They are also core agriculturalist who are involved in the growing of sorghum, maize and coffee, along the banks of Omo river. Of all their traditional ceremonies, none is more prominent than the “Ka’el” which means “the holiday of the fat men”. In their traditional calendar, the year starts in June. And in celebration of the new year, the Ka’el tradition is observed. The ceremony measures the body fat of the male contestant and rewards the winner with no more than fame and adulation of the people. Prior to the new year competition, each of the 14 clans of the Bodi tribe is expected to produce a male contestant who is unmarried. For 6 months, these unmarried men take one of the weirdest steps in fattening up. They feed on blood and fresh milk. For the entire period of 6 months, they are not expected to engage in any physical activity. Already, Bodi men are naturally overweight due to their large consumption of honey now this ritual helps to put on the extra weight. During this time too, they are not allowed to have sexual relations or leave their huts. Every morning the women bring them milk. The first bowl of blood is usually about 1-2 litres. Some may have a hard time finishing it and end up throwing up. Your guess is as good as mine…it’s probably not such a sweet experience. On the day of the Ka’el ceremony, these fattened men leave their huts for the first time since the competition. With their bodies covered with clay and ashes, they display their physical abilities before the elders of the community who serve as judges. The fat Bodi men spend hours usually under the sun, running around a sacred tree. The Ethiopian tribe does not slaughter their animals. So, for the festivities, the sacrificial cow is first killed with a sacred stone and then slaughtered. It is their traditional belief that killing the cow in that way helps to preserve the “nourishing” blood which is saved for the ceremony. With the dead animal’s dead intestine, the elders make predictions for the new year. After this is done, it signals the end of the ceremony as the winner of the contest is chosen and rewarded with the “Fat man of the year” title. Blood is a significant requirement in most of Bodi traditions. It is basically one of their main diets; alongside milk, sorghum or maize porridge. Meat is eaten during holidays and festivals such as the ka’el. In Bodi Tribe, the blood of the animal is collected through a deliberately punctured wound in the animal’s neck. After the blood collection, the wound is patched with clay. 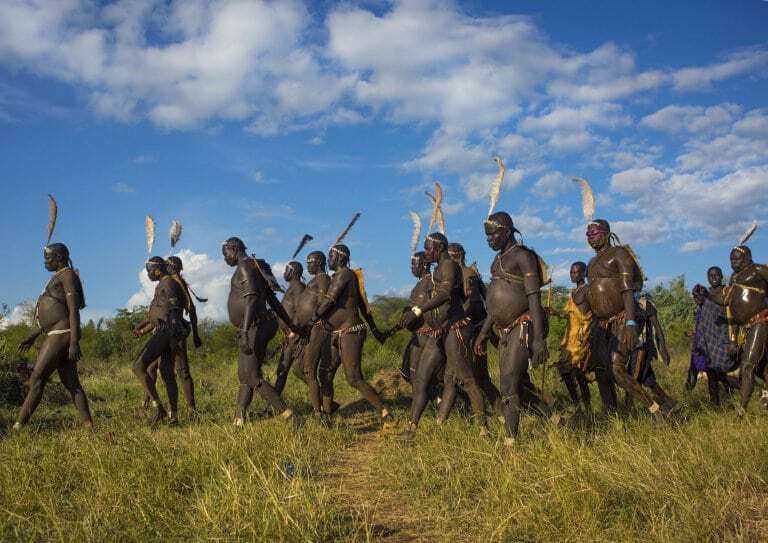 Just like their neighbouring Mursi tribe, Bodi men literally do not wear clothes. At most, they are seen mostly with strips of cotton tied around their hips with shaved heads. It may be hard to believe that such a bizarre tradition is still in practice today but the truth is that it is. Report says that the inhabitants of the Omo Valley are not welcoming to tourist activities and are very apprehensive of foreigners. With no external influence over time, the Bodi culture and tradition has remained undiluted and this is a good one as compared to other eroded or modified cultural practices and traditions of other tribes who have had heavy external influence.